Super Cloudbuilt has been one of those games that has been a tough review for me if I'm being honest. Falling into my emails about four weeks into the Summer holidays, I had to come back to it this week once the kids had gone back to school, as at the time of release I just felt like I wasn't giving it a fair shot. I couldn't decide if this 3D parkour platformer either just wasn't interesting enough to keep me coming back, or only being able to spare a few hours on it late at night was the reason it just wasn't pulling me back in. You can tend to decide if a game is for you very early on, and something just being fun to play plays a massive role in you turning something on again after the first few games of it. With giving this game a few more days of my time now, I think I'm ready to at least try and put some words together. While starting out with a simple jump, Demi soon starts to grow in moves that will be needed if you wish to take on each of the levels and beat them. You have moves such as air dashing, wall running, and a weapon to use too, which will all be needed at some point if you wish to beat the game. If I had to try to sum up what each of the levels were like to play in Super CloudBuilt, then one game I played recently instantly jumps to mind, that game being DeadCore. There are moments in SCB in which you are just jumping from ledge to ledge thinking that this game is going to be a cakewalk, to other times where you are pulling your hair out at something that looks so simple yet is really testing. It's this that sucked out the enjoyment of the game for me early on I think, with the game throwing in a bit too much for me before I got to grips with everything. You guys may like a challenge though so this could be totally different for you. Each level also throws a few collectable things to pick up, with the two big ones being item keys and life keys. Finding these will unlock lockers at the end of that level, with each one giving you something to use Finding one of the four lettered key cards will let you open a locker at the end of the level for a random item. Finding the life key will increase your life cap permanently by one. More lockers can also be unlocked by beating certain challenges too, giving each level some replay value if you want to explore it rather than just trying your best to beat it. These challenges show via a shiny blue orb by the door of that level, with things like beating the level as fast as possible, to not firing your weapon being two such challenges you can expect. What these do is make you tackle the level a different way, or it did for me anyway when trying a pacifist run. Not able to use my gun meant I had to go around certain doors and find a different route, to also just avoiding the enemies found on that level trying to kill me. You have a couple of other modes like ranked and rush mode, but with this just being more of the same, it's just something I never found myself sinking much time into. These modes are all about leaderboards, and that is something I've never really cared about in a videogame, but for those that do, these modes will offer all you need. You also have outfits to unlock for your character too, with challenges and certain things needing to be done if you wish to unlock them all. 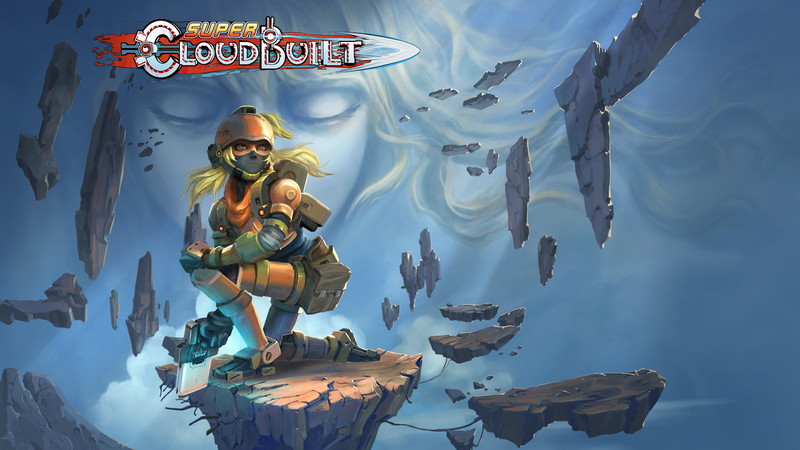 Overall: Super Cloudbuilt just wasn't for me sadly. My time is a valuable thing to me these days, so swearing at a TV while being stuck on the same level is not something I find enjoyable. Those who like a challenge will get value for money mind you, and I can't really fault the game in terms of looks and things, I just never found it fun to play. I've had this sitting on my hard drive for weeks now but haven't gotten round to even starting it. Watching videos of it confirmed my suspicions that the game will infuriate me so I have been playing other things, but I really should give it a go. Who knows, I might enjoy it!